Kirkbymoorside Quaker Meeting House is a traditional single storey Meetinghouse, built in 1691. The Meeting House has been recently refurbished, and now between 20 and 30 people worship there each week. 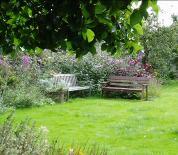 We won a bronze award in the Kirkbymoorside in Bloom best kept garden competition in 2008. Our garden is open to the public, so please visit and enjoy the tranquillity. 10.30 every Sunday. It lasts for about an hour, and is followed by refreshments and conversation. Children are always welcome. They join the main meeting for the first 15 minutes, then have a separate activity at the warden’s cottage before rejoining the meeting at the end. Children’s activities are organised by one of a group of people who have undergone a CRB check. Parents are welcome to sit in if they wish. It is accessed via a large door between houses no 79 and 81. The Meeting House is accessible to those with limited mobility, including an accessible toilet. There is a hearing loop for those with a hearing aid. Unfortunately we have no separate parking area, and on-street parking can be limited. Phone 01751 431054 for assistance.